Plan on at least 3 days if you are trying to achieve quicker results. Arrange your activities and prepare a schedule that will allow you to be patient and consistent—avoid all distractions like going to the store, answering the phone, dealing with sibling issues. Make sure spouse, grandparents and babysitters understand your method and plan. Make your child feel they have some control over the process. Be consistent with your approach and stay with the program unless you are convinced it is not working. Know when to give up and try at a later time. Offer lots of fluids so child will have to go more often. Make going to the potty fun—place targets in the potty, decorate the potty, sing. Praise and reward AND praise and reward progress. “Throw a party” the first few times your child uses the potty. Keep your child company while on the potty. Start both boys and girls sitting down on the potty. Make sure the clothing is easy for your child to get on and off. Do not consider nighttime dryness as a criterion for success during the initial potty training period. 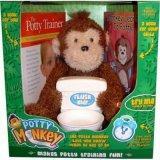 Potty training toys and dolls are excellent exhibitors of what is expected and what happens when urination occurs. Potty training books and cartoons are fun and informative—they should be read several times. Have your child watch you use the toilet. Have your child flush the toilet when you are finished. Explain poops go “bye bye” when the toilet is flushed. Keep diapers clean and dry at all times so your child gets used to this sensation and wants to avoid a heavy, wet or smelly diaper.